The techniques we use at Ultimate Strength are very important. No matter what the client’s level of training is, the technique remains the same. All movements on the specialised MedX machines are done very slowly to a cadence of 10 seconds up and then 10 seconds down. This method ensures that the training is done safely. All clients are individually measured on each machine (it’s not one size fits all). Detailed records are kept of every single workout. This will include the date of training, how much weight is lifted on each exercise and for how long it was lifted. At Ultimate Strength clients are timed on each machine; counting repetitions is NOT an efficient way of training. The philosophy at Ultimate Strength is to challenge the body and work it to the highest level of intensity appropriate to the individual client. This way the body is stimulated to make maximum change. For speedier results it is recommended to train twice per week, but once per week is enough for good strength and good health. At Ultimate Strength we provide one-to-one coaching, meaning during your workout only you and your instructor will be present in the training area. No one will be able to view you while you train. In order for your body to make that desired change, your exercise intensity must reach a certain level before your body will respond. By training to muscular fatigue, an alarm is sent to your body that more muscle and improved metabolism are needed. At Ultimate Strength you will use a training protocol that involves lifting and lowering the weights over a 10-second time frame amounting to a total of 20 seconds per repetition. This method eliminates acceleration and momentum which keeps the muscle under continuous load. All workouts are given an hour to complete. However, due to the intensity of the training, 45 to 50 minutes is all the time you need to achieve maximum results. In every session the whole of your musculoskeletal system is worked. It is a waste of your time to spend hours in a gym performing moderately hard exercise and achieving only average results. Keeping detailed records of your workout performance is very important. The records will show the dates of your workouts, how much weight you are lifting on each exercise and for how long you are able to lift it. By keeping records you will be able to monitor your progress over time. As your instructor, Yoram Sher will monitor every aspect of your workout and you will never be left unattended. Your safety and well-being is of the utmost importance. Yoram is a qualified fitness coach and sports therapist with over seventeen years of experience. At Ultimate Strength you will use MedX and Nautilus machines. These include the specialised core spinal fitness system, comprising Core Torso Rotation, Core Lumbar Strength, Core 4-Way Neck and Core Super Stretch. You can read more about these machines and see them in action here. To train properly, you will need focus and discipline. Therefore, at Ultimate Strength there will be no distractions, such as mirrors, television and music. Payments can be made by cheque, cash or bank transfer (cards are not accepted). Will I work to high intensity from my first session? No. The first session consists of a consultation, a medical history and an introduction to the weight training machines. Before high intensity is reached, you will need to become familiar with the techniques of strength training. The weights at the beginning will be manageable. Once you have perfected the techniques, the weights gradually increase, eventually reaching a level of high intensity. Why don’t I perform multiple sets like at other gyms? Muscle groups are composed of thousands of fibres. These fibres work together but fatigue at different rates. They are classified as slow-twitch, intermediate and fast- twitch. When you start an exercise the slow-twitch (type 1) fibres are activated first. When they tire, fast-twitch (type 2a) fibres are recruited, which have much less endurance than type 1. As the type 2a fast-twitch fibres fatigue, they are replaced by the type 2b fast twitch-fibres, which will have even less endurance. When the type 2b fibres tire, the muscle is no longer able to finish the repetition and the set must be stopped. If after a few minutes rest you perform another set, are different fibres involved? No! The same fibres as before are recruited again in the same order. Therefore, you will gain maximum muscle stimulation from one set. Any more than that is a waste of time and your recovery ability. Don’t I have to do aerobics to burn fat? There is a common misconception about the role that aerobics plays in fat loss. It is commonly thought that exercise burns a significant number of calories. It does not. Fact: One pound of human fat contains 3,500 calories. That’s enough to keep the average person going for a 50 mile run. An hour of aerobic activity may burn about 300 calories. Performed three times per week, it would take several months to lose even a small amount of fat. Often, weight lost from this type of activity comes from tissues throughout the body – muscle, bone and organ tissue, and a small amount from fat. People do not lose significant amounts of fat from performing a running or aerobics programme several times per week. Strength training builds muscle. One pound of muscle will increase your metabolic rate by 50 to 100 calories a day. That means five pounds of additional muscle will use an additional ½ to 1 pound of fat per week. An ideal fat loss programme needs to involve a balanced, reduced calorie diet combined with regular strength training workouts. If you enjoy running, cycling, football, tennis, etc. then do them because you enjoy them, not for any other reason. If I stop training, will my muscles turn to fat? No. Muscle and fat are two different types of tissue. Strength training builds muscle; stopping leads to loss of muscle. Over-eating makes one fat; reduced eating loses fat. One kind of tissue cannot be turned into another kind of tissue. Will women become over muscular if they strength train? Benefits of strength training for women are well documented. However, many women still fear that it will make them look masculine and unattractive. These fears are unjustified. Men are able to build substantial muscles because they produce large amounts of the hormone, testosterone, in their bodies. It is impossible for women to naturally produce the same levels as men. So, no amount of strength training will give women bulky muscles. Women are also endowed with a natural layer of subcutaneous fat. This fat covers the muscles and gives women their typical female appearance. Strength Training can no more make a woman masculine than it can make a man feminine. As soon as you are happy with the way you look, you merely freeze the load. You continue training on a regular basis, without increasing the weight or the number of repetitions. In this way you will remain ‘in shape’. Can I reduce fat in specific areas through exercise? No. Fat deposits will show a decrease in size, by diligently adhering to a low-calorie diet for several weeks. However, only a few ounces per day or a little more than a pound of fat per week can be lost. This loss will be from fat stored throughout your body, not just from a particular area that you focus your exercise on. If you pinch a fold of skin from the back of your hand, your forehead and then your hips, you will notice the comparative thickness between your fingers. If a reduction, of say 10% of fat throughout your body is made, which of the three areas will be noticeably smaller? Your hips will appear smaller; decrease in the other areas will be less noticeable, as each of these three areas will have been reduced proportionally by 10%. Will strength training remove cellulite? Over fatness, Loss of muscular, strength and firmness. Loss of flexibility of the supporting connective tissue in and about the areas where fat is stored. This condition can be combated by becoming and staying as strong as possible and remaining lean. As the muscles strengthen, they become larger and firmer, thus stretching out the skin and unsightly pockmarks, leaving a shapely contour. Should I strength train if I’m pregnant? The changes to the body as a result of proper exercise have much to offer expectant mothers, with no harm being caused to the foetus. There are conditions where high intensity strength training would be contra-indicated, but during a normal pregnancy this type of exercise should pose no threat. During labour a woman will experience high intensity muscular contractions. The ease of her delivery will be directly proportional to her muscular condition. Strength training is an excellent preparation for delivery. What do I have to bring with me to sessions? Normal training clothes – T-shirt top, track suit bottoms or shorts and trainers, plus a small towel (to place on machines for hygienic reasons) and a bottle of water. Can I eat before training? Ideally, two to three hours should elapse between eating and training. If you need to eat before training, have something light, e.g. a small piece of fruit. Yoram’s distinctive training format is more scientific and engaging, allowing you to see and feel the difference on a session by session basis. The closely monitored, self challenging approach makes the training sessions pass quickly – which for me makes this style of training so appealing. 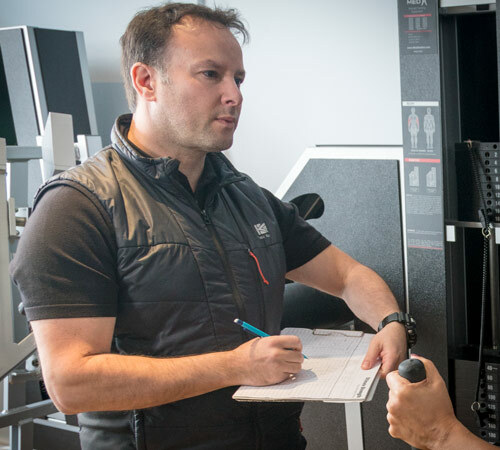 What distinguishes Yoram from many other trainers (apart from the actual exercise regime) is his extensive background knowledge of the body and fitness matters. Training with Yoram does not feel like the chore that one often associates with going to a gym. It is enjoyable, satisfying and rewarding- and different from any other form of training that you will have previously encountered. I can highly recommend Mr. Yoram Sher’s skill and guidance in strength training and the essential one-to-one supervision that is the hallmark of his gymnasium, Ultimate Strength. The key to success is graded physical exercise which builds muscle strength, using equipment specifically designed to focus on and isolate the function of particular muscle groups – and thereby avoid “trick movements” – which so readily occur without one to one supervision and which, thereby, undermine progress.